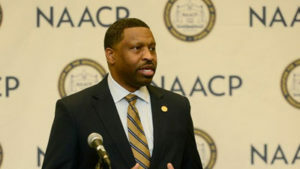 BALTIMORE —NAACP President and CEO Derrick Johnson released the following remarks regarding the Senate confirmation of nominee Brett Kavanaugh to the Supreme Court. “The U.S. Senate’s decision today to confirm Brett Kavanaugh to the Supreme Court is devastating blow to our democracy. It threatens the integrity and legitimacy of the Senate and the Supreme Court as institutions, and the nation may never recover. This day will go down in infamy for the Senate’s abject failure to exercise its constitutional duty to advise and consent. “The NAACP condemns this reckless & deeply partisan rush to confirm Kavanaugh after critical issues were raised about his integrity, temperament, impartiality, history of sexual assault, and judicial record. There is far too much at stake for every community not to have fully reviewed this nominee for the highest court in the land who will chart our future for a generation.